NASA image acquired May 25 - June 8, 2011 - Hazy skies greeted many Americans on June 8, 2011, as poor air quality dominated from the Midwest to the Atlantic Seaboard. There were several causes, but Arizona's Wallow Fire was a major contributor. Thick bands of smoke were visible in satellite images of the Midwest, and forecasts called for the smoke to move into the central and eastern United States. On top of that, weather conditions--high temperatures, calm winds--were just right for a classic summer pollution event in the East. One of the constituents of both smoke and urban pollution is carbon monoxide. 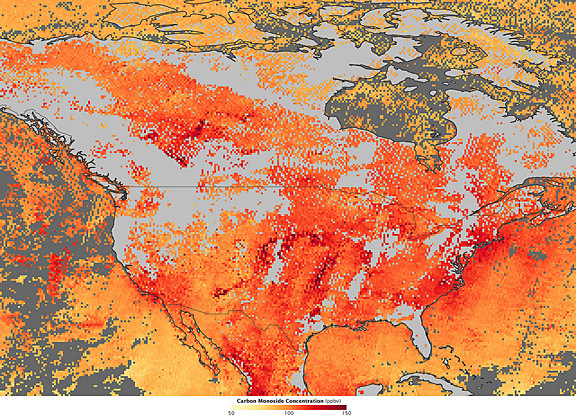 This map, made with data from the Measurements of Pollution in the Troposphere (MOPITT) sensor on the Terra satellite, shows carbon monoxide concentrations over the United States and southern Canada between May 25 and June 8. Dark red pixels reveal high concentrations. In the United States, most carbon monoxide pollution comes from vehicles and other machinery that burn gasoline; fires are a distant third in the rankings. In this image, however, fires were clearly a significant source of carbon monoxide. A dense plume flows east from the Wallow Fire in Arizona, with a fainter plume rising from the Horseshoe 2 fire in the south. The bands of smoke shown in visible satellite images are also evident in the carbon monoxide map. A second source of carbon monoxide is Alberta, Canada, where large wildfires are burning. A forecast from the GEOS-5 model (select "environmental," then click on the map) shows carbon monoxide from both fires moving east and converging over the eastern United States. Carbon monoxide measurements from the AIRS instrument on the Aqua satellite also track smoke moving east between June 3 and June 6. Finally, the map shows high carbon monoxide concentrations along the Atlantic Seaboard. Some of this carbon monoxide may be from the fires, but some of it comes from urban pollution as well. A high-pressure weather system brought in still air that allowed pollution to build up. The system also brought sunny skies and high temperatures that resulted in the formation of ground-level ozone. In high concentrations, carbon monoxide can harm human health by reducing oxygen to the heart and brain. Carbon monoxide is also one of the chemicals that create ozone pollution and urban smog. Poor air quality continued to plague the eastern United States on June 9, when the air was expected to be unhealthy for sensitive groups in more than 80 cities, triggering air quality action days in 49 locations. NASA Goddard Space Flight Center enables NASA's mission through four scientific endeavors: Earth Science, Heliophysics, Solar System Exploration, and Astrophysics. Goddard plays a leading role in NASA's accomplishments by contributing compelling scientific knowledge to advance the Agency's mission.